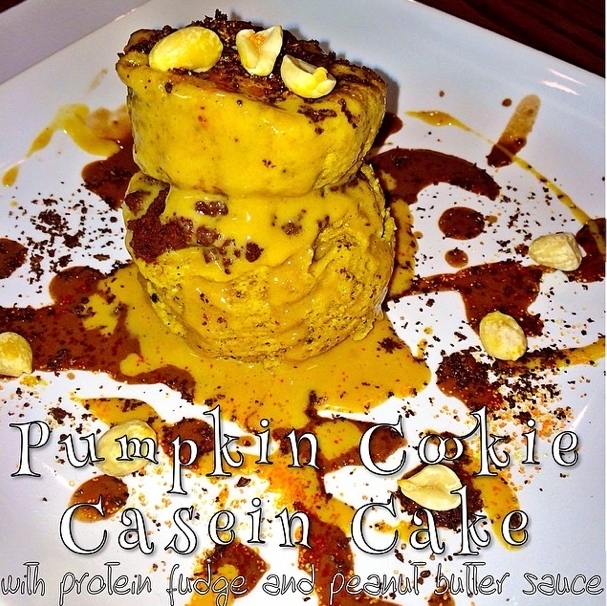 Pumpkin Cookie Casein Cake with a protein fudge layer and peanut butter sauce. I love pumpkin, chocolate and pb combined. For the casein cake, mix together: 1 scoop cookies and cream ON casein powder, 1 tbsp coconut flour, 1/2 tsp baking powder, 1/2 tsp stevia, 3 tbsp pureed pumpkin (not canned pumpkin pie), 2 tbsp egg whites, 1/4 almond milk. Mix, mix, mix. Put 1/2 mixture in mug, microwave for 1 minute 30 seconds. Repeat with second half of mixture for 2 layers. In between the cake layers is protein fudge: 1/4 scoop chocolate cake whey, 1/2 tbsp raw cocoa powder, 1/2 tsp stevia, 1 tbsp almond milk. Mix together and then microwave 15 seconds to thicken to fudgey consistency. Top with 1/4 scoop Protizyme peanut butter cookie whey mixed with 2 tbsp almond milk + 1/2 tbsp pb2.